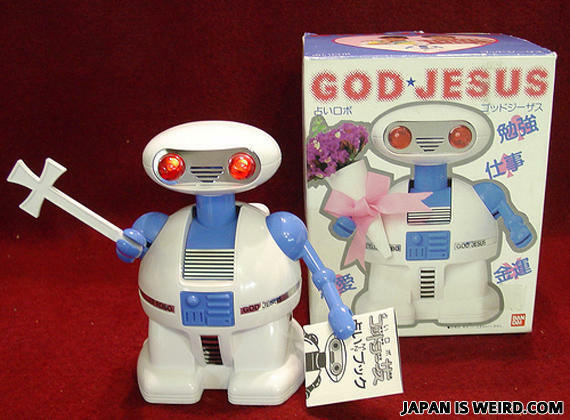 God and Jesus are actually, robots built by japanese. WHERE IS YOUR GOD NOW? God Jesus Robot rusted for your sins. ROBOT JESUS WILL CRASH. BUT HE WILL BE REBOOTED FROM THE GRAVE. Oh NOW I get it! God and Jesus are the same people! WHERE IS MY GOD NOW? ... oh wait... it's in that box. Haha, anyone else notice how the cross is disguised as a bunch of flowers on the box? Look, robot Jesus is bringing flowers! say the product name backwards.. bam. mindfuck. This is bad... I can see them making excuses "we japanese dont know what God is...! That's just our imaginnation...! Prease permit (they mean 'forgive')...!" It's a multiplication symbol people! God*Jesus = THIS! The power of Christ compels you...to stop that asteroid from hitting planet earth! Two members of the trinity, now in one convenient robot! BTW, Japan...I am disappoint. I am Jonny Number 5! why did the girl cry while watching starwars?